Welcome to our Sweat Sweet Shoppe! If you are alarmed by red dye, excessive amounts of sugar and under age workers turn away now! If not, stick around and see how we made loads of homemade taffy! 1 – .21oz (6g) package unsweetened, fruit-flavored drink mix (like Kool-Aid) (we used cherry)****however I used Great Value brand from Wal-mart and those were the measurements on the package and it said it made two quarts of drink. On the Kool-Aid packet that makes two quarts it has different amounts (far less) I would still only use 1 packet since it is still flavoring the same amount of water. Butter large jelly roll pan or a cookie sheet with sides really well. In a medium saucepan, stir together the sugar and cornstarch. Add corn syrup, water, butter and salt and stir well until butter is melted. Bring to a boil over medium heat and stop stirring. Cook mixture until candy thermometer read 250 degrees F (120 degrees C). This takes some time to get it to 250 degrees. Once it approaches 250 degrees watch very closely because it cooks quickly at the end. Immediately remove from heat. Carefully stir in vanilla and drink mix. Stir well. 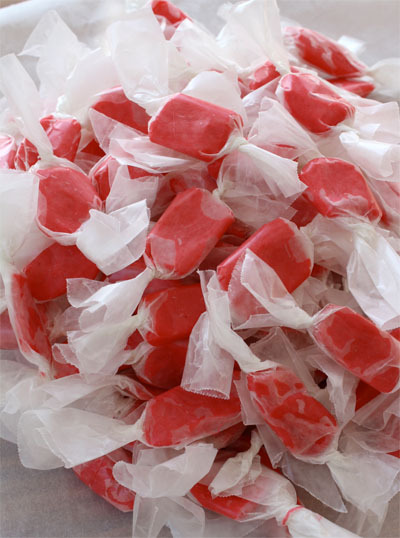 We should have stirred ours more– notice some bits of drink mix (dark spots) on our taffy. Pour mixture onto buttered baking pan. Allow to cool enough to handle, about 15 minutes. It will become more opaque and lighten in color depending on the attention span of your workers! This takes about 10-15 minutes of pulling. Pull into long ropes and cut with buttered scissors. and give it a good twist on each end. So I'm in Australia, and I'm finding it hard to locate the equivalent of Cool-Aid where I am. We used to have Tang and all the cordial powders I can find at line and orange - blergh. Can you recommend any alternative flavouring ingredient? A few points that will help a lot of people out temperature works well with a few exceptions elevation is the biggest one most recipe's out there call for 265 at sea level and can go as low as 250 the higher up you go the best way is to test your thermometer in purified boiling water and see how much lower than 212 it does at your place and adjust the temperature accordingly. The second big thing that will affect the temperature is humidity if it is really high you will need to cook it a bit hotter to get it to set up. Me and my 10 year old son tried this tonight. We followed directions to a "T" this was a ***SUPER FAIL***. Four hours later... half the "taffy" is all over my kitchen, our clothes, our skin, and the other half we actually got rolled into was paper. The clean up is HORRIBLE! The "taffy" never got to the point of not sticking to EVERYTHING and I used a TON of butter. I still don't think it is going to set into taffy. DO NOT TRY!!!! It is NOT at all fun or easy as these pictures make it out to be. Longtime candy maker here, one of the biggest mistakes you can make is letting your thermometer sit in the pan. The temperature reading will be off as the tip is touching the hottest part while cooking. You need to stir the thermometer through the mixture often, and quite often at the end to get an accurate measurement. Hope this helps! I don't have any drink mix and I don't like using flavoring extract. Can I use fruit punch instead of the water? Plus, I don't want to bother asking my parents to drive me to the store just to buy some packets of kook-Aid. Thanks for the recipe, love your blog BTW! Although my lame stove had a hard time heating to 250 :P this recipe worked great! I used corn starch to keep it from sticking to the waxed paper. I also used cherry flavor and red food coloring instead of the mix and it worked well! Good recipe! Hi there i am kavin, its my first time to commenting anyplace, when i read this post i thought i could also create comment due to this brilliant paragraph. It's really a cool and useful piece of information. I'm happy hat you just shbared tyis useful info with us. Please keep uus informed like this. Thanks for sharing. topic, which i am going to convey in school. Oh my god this so did not work for me. I got it to the right temperature easily enough - didn't take any longer or any less time than I expected, and as you said, it sped up towards the end. However, it just wouldn't set. Even remotely. It just stayed liquid with a VERY thin skin over the top. I left it for an hour, and my kitchen was neither hot nor cold - quite ordinary. I followed the recipe EXACTLY and my candy themometer has never given me any trouble before. Any suggestions? Wow! Just made this with tropical punch flavor!! Turned out so good!! I am sure my two little ones are going to beg me to make more this weekend!!! I actually used an electronic meat thermometer and still had no problems! Thanks for the awesome recipe!! Oh and thanks to the person that recommended the pizza cutter!!! Enjoy! 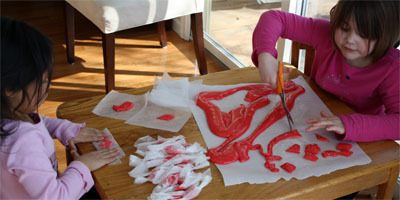 I look forward to this DIY Taffy, I also enjoy all of your wonderful craft ideas! Hi Jessica, I will admit candy making can be tricky since it has to cook to a very precise temperature. I have found when I have failure it is usually due to a bad candy thermometer. They seem to not last too long. 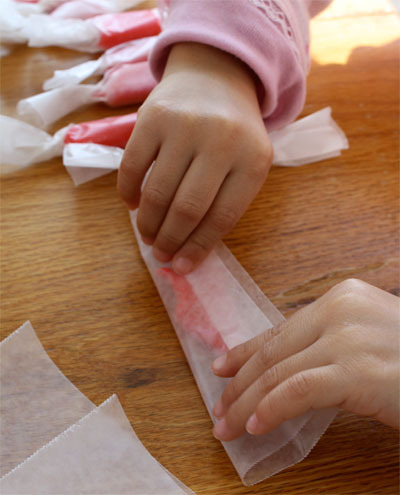 This is the best taffy recipe I have ever tried. Mine turned out just like store bought taffy. People having trouble with consistency need to rely more on the hard ball method (have a bowl of cold water and drip the cooking taffy into it. If the taffy has a crusty hardish texture -it's ready) the first time until they get a feel for their temperature gauge. My gauge is fairly new and mine was ready right at 150. It was a sticky, gooey mess, but that is how it's supposed to be at first. Let it cool and then pull (for a VERY long time). The longer I pulled the better it got, and yes I used lots of butter. I put a timer on for 20 minutes for pulling. 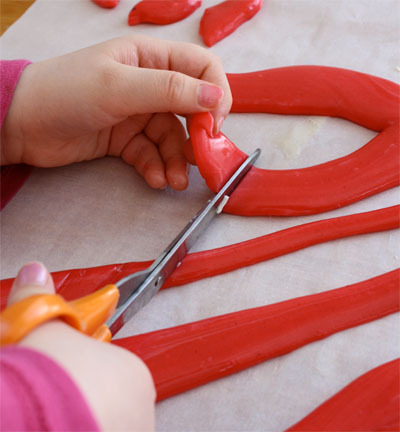 At 15 minutes it seemed ready and the additional 5 minutes at the end made it so the taffy didn't stick to the teeth as much. This recipe is going in the recipe box! i have not tried it yet but i bought Tropical punch kool-aid and cherry i am going to use Tropical punch.... it looks YUMMY! My husband found this recipe awhile back, and we tried it tonight. I think we didnt cook it long enough, and we didnt have a proper thermometer. Almost there though. Still tasty, just we have to eat it with a spoon! Going to try again though! I made three batches the other day and they turned out great! I figured I would make prob 6 batches total and hand little baggies out with christmas gifts. Although one batch, the cherry, I made the same as the rest but it sticks to the wrapper. I started just storing them in the frige and it worked better. Great recipe! Reminds me of the salt water taffy from amusement parks! The only problem I really ran into was after I pulled in and went to roll it out/cut it, the taffy kept sticking to the wax paper. I ended up just buttering the was paper slightly as well. "we probably used over 1/2 of stick of butter"
Forgot the "a" between of and stick! k walnuts. Cooked it to 160 and it worked great! Several other website recipes show cooking it to two hundred EIGHTY. It would be helpful to have an approx time of how long to get it to the required temp. Here is the problem that the people with a sticky mess are having. They are not getting it hot enough. I have done some research and a lot of other sites recommend cooking theirs to between 160 and 170 depending on how hard or soft you want it. 150 is NOT hot enough according to what I have read. The person making this recipe is either happy with a sticky mess (a good tasting mess howbeit) or their thermometer is a little off. On a good note, this is a very tasty recipe, and other than the cooking temperature is a great. 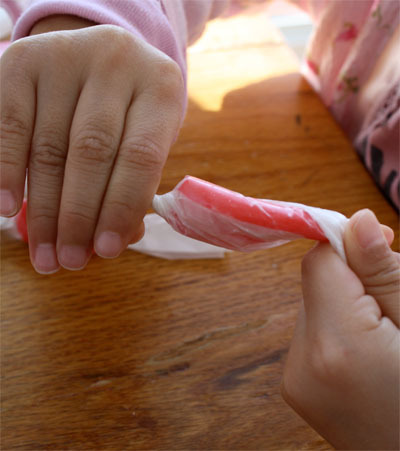 we tried this and it was a bit sticky and stingy at first but then after re-washing hands we (accidentally) discovered that if we left a bit of water on our hands it helped to get the taffy to the right consistency then after working with it, it was great. We ended up re-buttering and it seems great now. We are almost ready to cut it up. It may have something to do with elevation or humidity. For people who said it was a liquid soupy mess, you probably did not cook it long enough for it to reach the temperature at which it will thicken as it cools. I don't have a candy thermometor so i used the cold water method. when you've boiled it for a bit and you find that the texture changed to a bit thicker you just put a drop of the mixture into the cold water and if its a moderately hard ball that will keep its shape when touched it's ready. you just transfer the mixture to your greased pan and let it sit there until you can touch it. then you pull at it for about 20 minutes until it thickens and has a satiny gloss. Fun and easy! We made mystery flavors with clear koolaid. I must say it did stick to wax paper. Plan on spraying with Pam on some and rolling bits in corn starch some in powdered sugar to see which works best. I was making this with my friend and it started out fine and then we started pulling and it just fell apart! We pulled for about 4 min then it was already hard and it didn't stick together. I would love to make it again but i would first like to know what i did wrong. We think that we had to much butter on our hands when we started pulling but that doesn't explain why it got hard so fast. Please tell me what i did wrong. And also i dropped a piece on the counter and it shattered. mine didn't work at all! tisk tisk!! I'm a high school foods teacher and i thought this recipe would be perfect for class in our candy unit! epic FAIL. 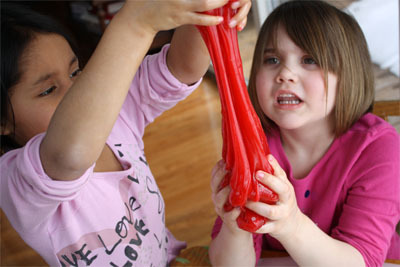 I ended up sending kids outside to lick their sticky hands because it was a mess! I went home and did the recipe TO A TEE and it still didn't work! I promise I'm not a bad teacher! Our candy thermometers are new! Anyone have any advice? Well my boys and I just attempted our first go at taffy making. I followed the recipe exactly and yet the end result was a sad,sticky mess !!! Needless to say we had some very disappointed kids( although the pulling part was fun). It just wouldn't harden enough to do anything. Not sure what went wrong or if the high humidity would have affected anything? Oh well, next attempt we'll try with grandma who had lots of experience!! At first I was ready to leave a really bad comment because the recipe was like water and it was just not thickening. But as time went by- lots of time- the boiling syrup thickened and started to look much like toffee my dad used to make for us. I used sweeto syrup concentrate for the colouring and I didn't even need a candy thermometer as the stage in water makes threads that are pliable, that's when its perfect and it looks and tastes great, my 3 year old and I are about to start stretch it. Wish me luck!!! We're going to do this for one of the "art" projects for my daughter's "arts and crafts" birthday party today, but are going to cook it in the microwave. Hadn't thought about using kool-aide before! Should be fun! 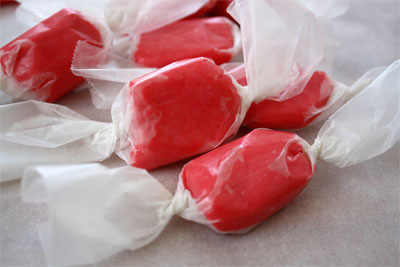 Does it turn out hard or soft like saltwater taffy because I tried another recipy and it was terrible after a day? This looks awesome! Can't wait to try it. I even have all the ingredients in my cupboard already. Also, we used pizza cutters instead of scissors and that worked out great. The first time I made it I let my thermometer sit on the bottom of the pan (never used one before) and ours was a sticky mess too. But, when I learned to not set it on the bottom, the temperature was actually right and it turned out great. Cherry and Fruit punch turned out great! Grape flavor was very bitter. I don't know if I did something wrong, (other than cooked it a little hot and got hard candy). Otherwise, easy to make and lots of fun. This has not been turning out for me and my girls. I don't know what I am doing wrong. HOW LONG does it sit in jelly roll pan? We have a sticky stringy awful mess! It boils and bubbles, we don't stir it and it takes forever to get to 250 degrees. How long do I leave it at 250 degress? 1st time taffy maker that does not want to admit defeat. Any helpful hints will be appreciated. We only let it sit long enough in the jelly roll pan to cool just enough so we could touch it. It does take some time for it to get to 250 --- but not forever, so I am wondering if you have a bad thermometer. It actually happens that they go bad. I hope this help! Please let me know! 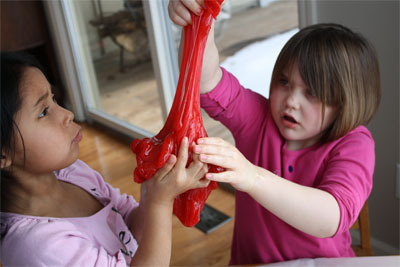 I had a babysitter as a child that used to make this with us. Memories! I look forward to doing this with my kids this holiday season. Using Kool Aid is brills! is the taffy hard? or is it like salt water taffy soft? there's no way i could let my son near those kind of scissors yet , it doesn't seem like they cut straight anyways. We made the taffy tonight. Turned out great. Thanks for the great idea! how long can this be stored? and if it sits for too long will the wax paper be hard to pull off? I only have the clear kool-aid, think it'd be okay to add food coloring? I'm thinking I'd add it when I add the vanilla and drink mix... any thoughts? What a fun project to do with children. I will have to have my grandchildren over this summer and give this a try. Thanks for sharing. About how many do you think this made? I just finished making this with my family. We all love it! Thanks so much for the recipe, I know we'll be making this a lot more! Thanks for sharing, look forward for more fun recipes! 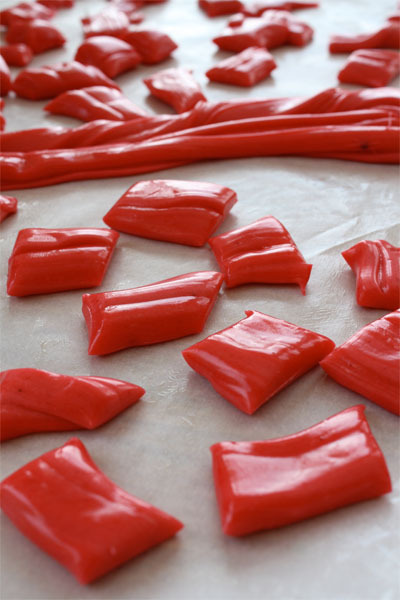 I have a couple of taffy recipes tucked away that I've not tried out of fear of pulling by myself! This makes it look like I could totally do it, though. :>) I linked on my weekly roundup (post is under my name) - thanks for the tiny shot of confidence!! So much fun! i can't wait to try this with my daughter! This is awesome! Just stumbled it for you!! Hi there, I skipped on over here from ohdeedoh. Great tutorial! I don't know if we can conquer it, but I love knowing that it can be possible. Great blog... I'll be visiting often! What a great idea! Thank you so much for sharing this idea with us! After some unusual sunny days, the rain has hit Seattle again. I think this will be a big hit for a rainy day activity! Thanks for sharing! 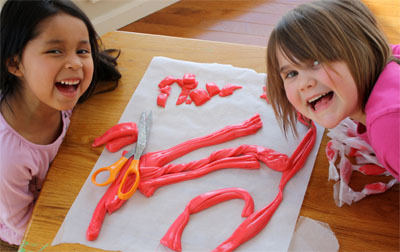 My kids and I are going to make this on Friday, for sure! I love that you use kool-aid to flavor and color it. The possibilities are endless!! Wow! This looks so fun and messy! 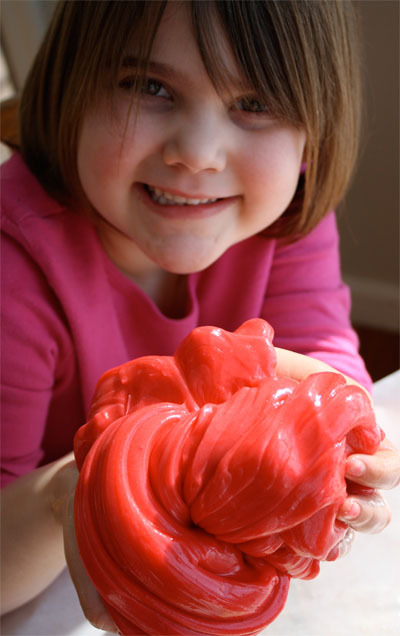 I love taffy, and would never have thought of attempting it myself! i think i will try with my kids, looks yummy and fun ! i love your pics ! That looks fabulous! The taffy that I used to love has egg whites in it so I stopped eating it. I think I might have to make this, I miss taffy so much! I'll be linking. Looks like so much fun! Instead of using butter on the kids hands could you just spray them with non-stick cooking spray? You probably could spray the hands and I probably would have tried that if I had had some, but it does take alot of butter--- I mean 1/2 a stick or more so I think the flavor might be better with the butter. Fantastic! It looks like a lot of fun but also a lot of work. How long did it take you? I'd love to give this a try. This is such a good idea and the cutest pictures to show it! I so am going to have to try this with my son and his friends. Thanks so much for sharing. This is beyond adorable! I just love the idea and the images of your children are so precious. Thank you for sharing. I foresee some pink and purple taffy in my immediate future. Do you have any suggestions for an alternative to using corn syrup? perhaps honey or agave? How fun does that look?! I'm definitely going to have to try this one with my kiddos. Thanks, Cindy! Cool! I remember my aunts making this when I was little, and it's a very fond memory. I'll have to make it with my kiddos when they're a bit older. The red looks so pretty! 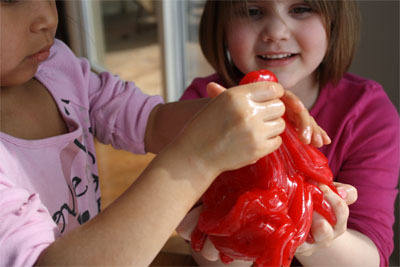 Oh what a fun project and a great way to involve kids! These look sooo yummy!! OH MY HECK!!! This looks like so much fun and yummy too!!! So adorable! The pics of the girls look like they had so much fun!